Researchers at the University of Alabama at Birmingham are using a three-prong approach to reduce or eliminate cervical cancer in their state. With the assistance of a well-established, diverse coalition, approach one employs direct action organizing principles to educate and mobilize community stakeholders to advocate for public policy changes that enhance cervical cancer screening and HPV awareness. 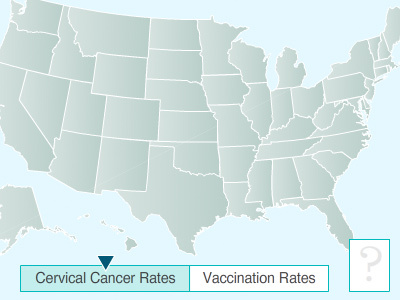 Approach two uses community-based teen health educators as agents of change within the local school system to increase HPV awareness and knowledge. Capitalizing on the importance of teen health educators, approach three involves the development of an interactive website with cell phone text messaging capabilities that supplements current in-school HPV health programs. Based on the outcomes of these projects, we anticipate changes at the individual, interpersonal, community systems, and public policy levels of changes. Mona N. Fouad, MD, MPH, Professor of Medicine, is Director of the University of Alabama at Birmingham (UAB) Division of Preventive Medicine, Director of the UAB Minority Health and Health Disparities Research Center, and a Senior Scientist in the UAB Comprehensive Cancer Center (CCC), where she leads the Cancer Control and Population Sciences Program. Recognized nationally as a leader in health disparities research, Dr. Fouad is member of the NIH National Advisory Council on Minority Health and Health Disparities. She is the principal investigator (PI) of numerous federally funded projects with the common theme of improving health and preventing disease in minorities, among them the NCI-funded Cancer Care Outcomes Research and Surveillance Consortium (CanCORS), the NCI-funded Prostate, Lung, Colorectal, Ovarian Cancer (PLCO) Screening Trial, and the National Lung Screening Trial (NLST). Warner K. Huh, MD is Professor in the Department of Obstetrics and Gynecology, Division of Gynecologic Oncology at the University of Alabama at Birmingham (UAB) and a Senior Scientist in the UAB Comprehensive Cancer Center. Dr Huh’s research interests include vaccines for cervical neoplasia, in vivo spectroscopy for cervical neoplasia, and the development of novel screening and treatment strategies for gynecologic malignancies. He serves on the board of the American Society of Colposcopy and Cervical Pathology (ASCCP) and is the co-leader of two projects and sits on the steering committee of the Johns Hopkins-UAB Cervical Cancer Specialized Programs of Research Excellence (SPORE) program. Dr. Theresa A. Wynn serves as a Program Director II in the UAB Division of Preventive Medicine. She is also the Project Director of the 5-year, CDC-funded, Racial and Ethnic Approaches to Community Health across the United States (REACH US) Center of Excellence to Eliminate Disparities (CEED). The REACH US CEED operates in six states: Alabama, Arkansas, Kentucky, Louisiana, Mississippi, and Tennessee, and serves as a clearinghouse of evidence-based strategies and promising community practices to address the root causes of cancer disparities across the Mid-South. Dr. Wynn also assists with REACH UP & OUT project funded by the National Center on Minority Health and Health Disparities, and with the Deep South Network for Cancer Control program, an NCI-funded initiative to oversee the community outreach core which operates in 14 counties across Alabama and Mississippi. In addition to the aforementioned studies, Dr. Wynn served as the PI of six extramurally funded projects focusing on addressing cancer and other health disparities among minority populations. Outcomes from her Shop Talk, salon-based project were featured on the National Public Radio – All Things Considered Broadcast, in Women’s Day magazine, and Readers’ Digest.